No one has deputized America to play Wyatt Earp to the world. Saying the Washington Post is just a newspaper is like saying Rasputin was just a country priest. Bill Clinton's foreign policy experience stems mainly from having breakfast at the International House of Pancakes. New Updates! (4/20/2019) We've been working really hard on completing our membership system so you can submit quotes and keep track of them. Once this is complete in the coming weeks there will be a lot more quotes by Pat Buchanan and other authors. 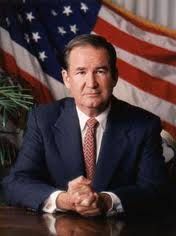 We've also changed the sorting on the site so you now see the latest Pat Buchanan quotes first. Our goal is to have the best Pat Buchanan quotes on the web!